So as I was drifting away to sleep the other night, I had this idea to make s’mores with Rolos instead of chocolate bars. The next morning, I ran to the store to get s’mores supplies when I saw the Reese’s Peanut Butter Cups and thought, “I like peanut butter and chocolate. I like peanut butter and graham crackers. I like peanut butter and marshmallows. I’m pretty sure I can’t go wrong here.” So I got some of those, too. And I thought I was a genius. We-ell, I was reading through the responses on our current giveaway and not only did someone mentions Rolos s’mores but they ALSO mentioned peanut butter cup s’mores. I was crushed. Okay, maybe not crushed–it takes a lot to crush me these days and it’s gonna take more than a chocolate-covered caramel to do that. But I was not the genius I thought I was. On the up-side, both of them mentioned those s’mores as the most delicious thing they ate that summer. Because it’s still way too hot outside here for campfires, I’ve been making these in the oven. I first had oven s’mores at a camping-themed church dance as a teenager (because camping and teenage dances are a natural pairing) where they were the treats. It was such a cute idea and I am not lying when I say that hot, gooey messy s’mores are awesome, but after they cool down and set up again, they are also awesome in their own way–a little more like cookies. These would be perfect made ahead of time and served on a dessert table or as a classroom treat. Anyway, you can seriously make these in 5 minutes, if that. All you do is lay your graham crackers out on your cookie sheet, place a marshmallow on top of the graham cracker, and place the pan in an oven with the broiler on (use the low broiler setting if you can adjust it; otherwise, a broiler’s a broiler). Cook for about 2 minutes or until the marshmallow is as toasted as you want it and then top it with a Reese’s Peanut Butter Cup or 2 Rolos (unwrapped. Do I really have to say that? You’d think I wouldn’t. You’d be surprised.) The peanut butter cup is pictured here because although I prefer the Rolos, this is a G-rated blog and Freud might have something to say about my Rolo pictures, even though they were better in quality. Top the toasted marshmallow and chocolate with the other graham cracker square and eat it up immediately. Of course, you can ALWAYS do these over an open fire. I’m not gonna stop you–hey, give me another month and I’ll join you! Or not. Remember the potential for double awesomeness here. Break several sheets of graham crackers in half. 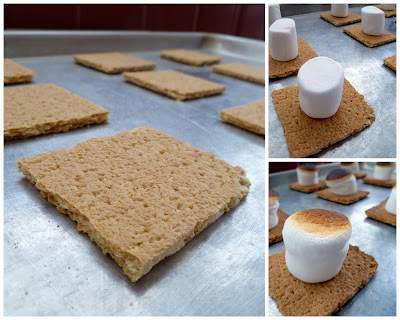 Place the desired number of squares on a baking sheet and top each square with a marshmallow. Place the baking sheet in an oven and turn on the broiler. Broil the marshmallows for 2-3 minutes or until desired doneness is reached. Top each marshmallow with 1 peanut butter cup or 2 Rolos. If you want, you can pop the baking sheet back into the oven for another minute or so to melt the chocolate. Top with another graham cracker square and serve. These can also be made the traditional way by toasting a marshmallow over an open fire. Sounds delicious!!! A new one we tried this summer over a campfire-but you could use it here, too- is Andes Mints! We stuck the mint inside the marshmallow before we roasted them! Nice and melted along with the gooey-goodness! Thanks for all of your wonderful ideas!! Have you had Banana Boats? Use a butter knife to cut through the peel of the banana making only one straight line as this will open up the peel for you to make your boat. Place mini marshmallows, peanut butter chips, chocolate chips, carmel chips, butterscotch chips (or pretty much anything you want) inside the peel. Then Wrap the whole thing in foil and either cook in oven like the s'mores or use the coals for just a couple minutes at the campfire in the fall when you go camping. Hobo Meals: Get about 8" piece of foil and fill it with cooked meat, raw potatoes, carrots, onions, add salt and pepper to taste. Italian Dressing could be used as well or Patti's Seasoning (from Patti's Restaurant -Home of the 2" thick pork chop- in KY) Place over campfire for about 5-10 min. or until veggies are cooked to your liking and enjoy! Just some campfire favorites! Enjoy! Im an aussie who has seen waaaaay too many american movies and ALWAYS wanted to try s'mores and now I think I can except….I have no idea what graham crackers are! I know I havent been able to find them here so I was wondering what properties I should be looking for in a substitute biscuit? Hi! I had just found this recipe and saw your comment. I know it is almost a year old but I have read somewhere that shredded wheatmeal biscuits might be a good substitute or digestive biscuits. I don’t know if you would still be interested or have already found a good one! Graham crackers are very similar to your digestive biscuits. My kids borrowed a book from teh library about easy kid cooking. It had Smores in it, from the microwave. Which works well if you don't have a fire or if you don't want to fire up your stove and heat your house all up, and if you don't have propane for your grill. I didn't have any bars, so I used chocolate chips and you just need to watch your marshmallows in the microwave so they don't explode. I love pb too so I smeared one side of the crackers with pb after the microwave and they were delish. Of course probably tastier and definitely easier with pb cups. I know this is a little off topic, but your rolos idea reminded me of a recipe I got from allrecipes. I can't rememember what the original title is, but my husband calls them red-neck turtles. You place about 20 square or small twist pretzels on a cookie sheet, then put an unwrapped rolo on top of each one. Put them in a warm oven until the rolos get soft, maybe 5 minutes. Then, you press a whole pecan into each rolo. Drizzle with a little white chocolate to make them pretty and let them cool. They are addicting! @Arlina: I think the British/Aussie equivalent is a digestive biscuit. This reminds me of when I was a kid and we made peanut butter and white chocolate smores…mmmmmmmmmmm. Like a dah, I never thought to use anything else…I don't care for plain chocolate so these would be just right…love the comment about the 'other' photos…gave me a good giggle! i like to completely dip marshmallows in chocolate coating and then keep them on hand for microwave smores. you just take a dipped marshmallow, place on a graham cracker and microwave 8 seconds. then take it out and place the other graham cracker on top. yummy! Good Lord almighty. Im in for it now. Geesh. I made these with Reeses tonight & they were awesome! These look amazing. I never thought about making them in the oven, I always made them in the microwave. My sister-in-law introduced me to Reese's over the summer – and I can't go back now!! The reese's are the only way I will eat a s'more now! We've been making them that way all summer long! you can't do it in the oven since the chocolate would melt but we use fudge stripe cookies and marshmallows, then the chocolate is on the cookie and more melty than a chocolate bar, reese's are yummy too! Too bad you had me totally laughing out loud with the Rolo picture deal. I'm lovin your blog. Keep up the great work. You girls have it figured out: yummy and clear recipes, beautiful pictures, clever dialogue. Love it. Try using HobNobs. They are a bit thicker and heavier than a graham cracker, but so delicious. oh my goodness those look so fun! I think you just gave us our treat for FHE next week. Can't wait to try them! I've thought of doing this but never have- great idea! Great photos too; I need to try these with PB cups! Lol on the Rolos and the G-rated blog. LOVE this blog! Out here in KY, Reese's are right next to the grahams and marshmallows because it's such a popular combo. We found that they taste the best when you sandwich the Reese's between 2 marshmallows or if your mallow is big enough, wrap it around the cup so it melts better. Arlina doesn't have a blog but I did find someone that has a recipe on theirs for homemade graham crackers. I'm hoping to try it myself. Good luck! I still think you're brilliant. Shane came up with a new thing this summer: the open faced s'more. Only use one graham cracker. Less mess, and quite delicious. Seriously… considering going to Walmart RIGHT NOW to buy the appropriate ingredients. Btw – is it regular sized reeses cups or the miniature ones? Thank you SO much for this! I Googled "oven smores" and your entry came up #8! We just got back from Labor Day camping. We camped right on a lake and unfortunately, it was just too windy to do smores. So I brought all the stuff home and I think I'll do this for my kids for an after school treat today! I bought rolos to do the easy pretzel turtles and bought reeses cups just to do these oven s'mores! Another easy oven-smore recipe is to grab a piece of tinfoil, pile all the yummy smore ingredients you want, and then fold it up “tinfoil dinner” style and pop it in the oven for a few minutes. I do this while my kids are eating lunch and so for dessert we get a yummy smore!